While your lawn, trees, and garden may not need as much attention during the winter as they did during the summer months, the winter is still an ideal time to make a plan for its care to help it make it through until spring finally arrives. Just because you cleaned up in the fall, doesn’t mean you can sit back and ignore your lawn through the winter, especially if you want your grass to come back lush and green. Many of the things that you need to stay on top of to ensure you have a healthy lawn come spring, start with the proper winter lawn care regimen. Winter can be a particularly harsh time for your lawn as plants and grass go dormant during the colder months, and there is no surefire way to predict whether or not they will survive until spring finally arrives. There are some ways that you can stack the odds in their favor right now during the winter. With the proper winter lawn care plan, you can work to ensure that when spring finally comes back around, you will have a lawn full of healthy, green grass that will be the envy of the entire neighborhood. We have put together a short list of four tips to follow this winter to help you attain that lush, beautiful lawn you want this coming spring. While most leaves and debris should be cleaned off of your grass during your annual fall cleanup, winter comes with its own particular debris that can be just as essential to remove. Leaves and other debris can blow around during the winter and start to cover up portions of your grass or sod, and if these debris begin to pile up too much, they can block the sunlight from reaching your grass. This will prevent the nutrients your grass needs from reaching the blades, and make it much harder to bounce back this coming spring. It is also important to keep snow from piling up too high, as the added weight can create large dead spots on your lawn that can leave you grass stunted and thinner in those areas. Proper mulch around the bases of your plants can actually serve a dual purpose. First, it will help to protect perennials and ground covers from freezing damage, and second, it will help trap moisture in around the base of the plant, allowing it access to water for longer. This will help to reduce evaporation and work to maximize the amount of water available to your plants. Watering sod areas is one of the most important Howell landscaping maintenance items on your winter to do list. Large portions of sodded areas in your yard can die if they don’t receive any precipitation for several months, which means you need to ensure they are getting the moisture they need. That being said, there are some guidelines to keep in mind. One being that you should only water these areas when the outside temperature is above 40 degrees Faherenheit. You want to make sure you are only watering during the middle of the day to keep water from freezing over the yard once it gets cold. Early winter is one of the best times to fertilize your lawn, especially if it is composed of cool weather grasses, like Bermuda or bluegrass. Giving your lawn a thorough fertilization will help it replace a lot of the lost nutrients from the summer months. The best part is that the fertilizer will remain in the soil and feed your lawn’s roots all winter long. 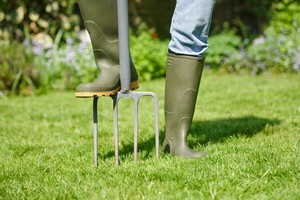 This is made even easier if you make sure to aerate your lawn early in the winter as well. Aerating your lawn will allow nutrients to get down deeper to your grass’s roots, helping to maximize the amount it is able to absorb. If you are looking for lawn winterizing experts in the Howell area, give us a call today at 734-564-1373 or fill out our online request form.